Some people think the only places you can find no-fat, no-salt, no-sugar foods is at a Whole Foods, Trader Joes or other similar upscale store. I beg to differ. I regularly shop at Costco and, while it takes some work, you can find plenty of acceptable things to eat there, even on a restricted diet. 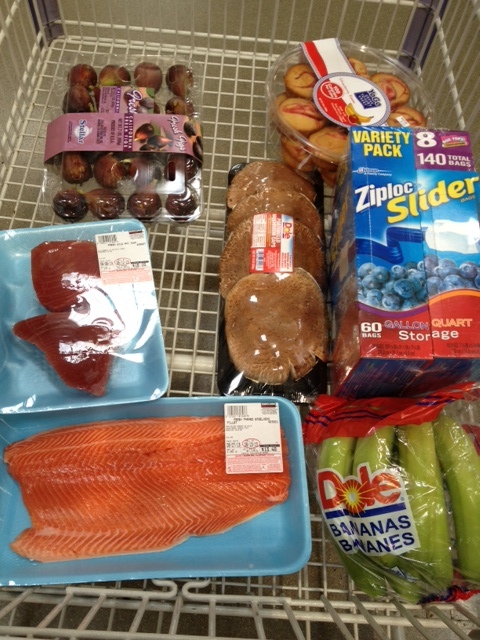 The photo here shows a recent cart full of items I bought at a local Costco. Salmon had been cheaper at Costco than at other retailers. Lately though, I’ve noticed Costco has raised its salmon price to $8.99 a pound, comparable to other retailers. You can find items for your restricted diet even at a warehouse club like Costco. Costco produce is normally less expensive than more mainstream stores, if the produce isn’t on special at those stores. I regularly buy my bananas there. I also regularly buy the portobello mushroom caps you see in the photo. And I look for seasonal favorites such as the California figs you can see in my cart. Baked goods are largely taboo on my restricted diet and I miss them almost more than life itself most days. Costco recently has carried the low-fat, Greek yogurt-based 100-calorie muffin tops you see in the cart. They’re not chocolate, and I find them a little dry, but at least they’re something more substantial than lettuce. The point is shop around, you can find what you need in unexpected places, as I’ve written before. Costco’s bananas haven’t held up well for me. They are too green to see the bruises they carry, and they all tend to ripen so fast that I don’t eat some of them. Still at the low price, a value just the same. I generally splurge for bananas at a particular Raleys. This particular location supplies absolute consistent best bananas. I gladly pay extra for correct ripeness. -sparkling water. Simple carbonated with no sweetness. … concerning Costco’s whole chicken; I believe Costco’s cooked Whole Chicken has dextrose injected or maybe there is some other reason I refuse to buy when I read the label, but their organic whole chicken has been very good. I am about to see if I can find an even better tasting whole chicken at Trader Joes. I cook them in an Instant Pot pressure cooker. Seems just about all Items sold at costco have much of the sins: high fat, high saturated fat, or Sugar, or high sodium, or fake sugar. If you look at the patrons, they tend to look over-weight and un-healthy, similar to some walmart shoppers. not a prejudice, just an observation. I shop at both places. thanks for the insights Roger, all the best to you, eating healthy is a constant battle.